The Mayoral election’s hangover is still at place. 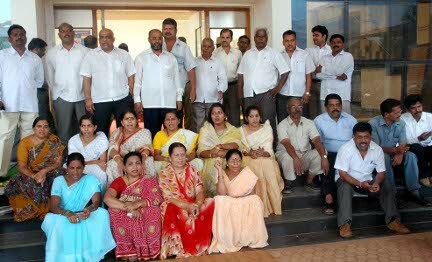 The 38 member Belgaum Development Front(BDF) staged a dharna at the gate of City Corporation at the time of the arrival of the Commissioner. The councilors, led by Latif Pathan, Kiran Sayanak, Dhanraj Gauli and Parshuram Dhage, staged a dharna on the corporation premises, to protest against rejection of all but one set of nomination papers for the post of Mayor. Seven sets of nomination papers were filed for the post, including those by Mr. Pathan and Mr. Gauli. They demanded the certified copies of the nomination papers filed for the mayor and deputy mayor’s posts. The BDF plans to take this matter to court and they can file a petition within 15 days of the election. To file the petition certified copies of the nomination papers are required. The councilors alleged that the corporation officials are intentionally delaying the process of providing the certified copies, bending to political pressure of a local MLA. 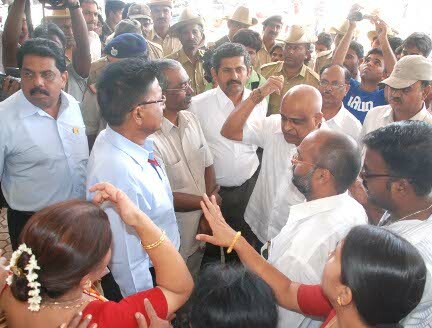 As Commissioner S G Patil assured to provide the certified copies on Wednesday the dharna was taken back. need power of mayor for wat to……….? Also we should think from our end what we can contribute to the society & preserve the public properties to reduce the taxes….. There is no great achivement done by kar-nataka govt. Its another “Political Aatyachar” on Belgaumkar’s. KRV should fight against injustice if they really want belgaum;s development..